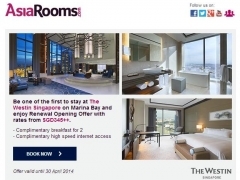 Located downtown in Singapore's prestigious financial district, we are situated on beautiful Marina Bay. A very short distance from corporate headquarters, retail shops, variety of restaurants and casinos with direct access to all that Singapore has to offer. Each of our 305 inspiring guest rooms and suites are designed to let you be at your best. Located on level 33 to 46, the floor-to-ceiling windows energize the rooms with natural daylight, offering panoramic views of the Marina Bay and the city skylines. Get an amazing night's sleep in our signature Westin Heavenly® Bed, enjoy the signature Westin Heavenly® Bath with signature Westin bath amenities. Balance your senses and rejuvenate with a signature treatment in the Heavenly Spa by Westin™. Recharge in our WestinWORKOUT® Fitness Studio, complete with all your fitness requirements including free weights and cardio equipment. Whether traveling on business trip or enjoying a relaxing leisure visit, experience our outdoor Infinity Pool on level 35 with distinctive views of Singapore’s south coast.